What is the Modern Day Medici Effect? At the beginning of 2008 I wrote a post called The Content Crossroads: Supernatural Success at the Intersection of Ideas. The point of the article is that innovative content often comes about when you connect two seemingly unrelated ideas or topics to come up with something fresh and new. 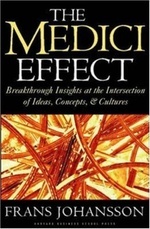 While there’s a lot going on in that post, a fundamental aspect of the piece involves what’s known as the Medici Effect, thanks to Frans Johansson’s excellent book of the same name. Poets, philosophers, scientists, architects, painters and sculptors from all over Europe and elsewhere came together in Florence, Italy, between the 13th and 17th centuries thanks to the patronage of the wealthy Medici family. By attracting talented souls from so many different fields and cultures, the Medicis got all these creative people in contact with one another to trade ideas and collaborate. This intersection of concepts and diverse backgrounds kicked off the Renaissance, one of the most innovative eras in human history. A lot of people seemed to get a lot out of that post, including Copyblogger’s own James Chartrand. He picked up that there was an unspoken subtext to the article that indicated we were involved in a Medici Effect of our own (this time with Al Gore Vinton Cerf and Timothy Berners-Lee to thank instead). That’s right… the modern day Medici Effect is made possible by the Internet and the Web. More specifically, social media. Check out The Top 10 Social Networks for Creative People. This goes well beyond just the usual suspects, and I can guarantee this is one of the most comprehensive and meaty “Top 10” lists you’ll ever encounter. Next article: Why Should Anyone Read Your Blog? Landscape historian J.B. Jackson called this kind of junction a “cultural hearth,” which is not nearly as good a name as the Medici Effect. Thought the Lateral Action post was terrific (read it earlier today), I was inspired to check out a few new hangouts. This is happening because people think that the ordinary is boring. Special associations will create an impact on their brain and will consider such an article something new even thou it presents a common story. You know, the post you speak of (and the one I wrote about it afterwards at MwP) is a post I come back to consistently and often. I can’t shake it from my mind, and it has profoundly influenced my year. There is *so* much opportunity at our fingertips today – all we have to do is choose our path. Sorry mate, your post was in my mind but as you know I had to stay up past my bedtime to add all the links on that post, so it looks like I dozed off and missed one! Best reason yet for those of us in associations to embrace the web … I throw out the question to those “non-engaged” association members to make this call to others in a way that changes the association model. Worse, I forgot James wrote a follow-up post and linked to his comment instead. D’oh! Not only do I want to go back and read that post, several times, but I want to read the Medeci effect as well. I’ve never heard of the book, but it’s one of my biggest beliefs that we’re at the lip of a Renaissance, should we choose to accept it. There’s just more ways of interaction and creativity in these days and through the web. Naturally you will see this happen. I think I like “cultural hearth” on a chilly, windy day. I liked Triiibes, then I liked it even more when a notification came through that one of the groups I had chosen had a new member; a woman I hadn’t seen in several years when we were acquaintances in another state! Now I really liked Triiibes! I hooked up with my first Ning network Wednesday. I think I’m really going to like Online Business Manager Connections. I crave physcial solitude and sometimes virtual solitude, but I also like to get things done and be there when things happen. I try to choose groups that look as if they will Do things and have something happening.